As the unacknowledged son of the lecherous Lord Westleigh, John “Rhys” Rhysdale was forced to earn a crust gambling on the streets. Now he owns the most thrilling new gaming establishment in London. Witnessing polite society’s debauchery and excess every night, Rhys prefers to live on its fringes, but a mysterious masked lady tempts him into the throng. Lady Celia Gale, known only as Madame Fortune, matches Rhys card for card and kiss for stolen kiss. But the stakes are raised when Rhys discovers she’s from the very world he despises. Rhys accomplished the gaming hell’s sale and reopening within three weeks of calling upon his half-brothers. He changed the decor and the menu and retrained all the workers. Madame Bisou’s became the Masquerade Club and news of its opening traveled swiftly by word of mouth. The first days had been stressful, but each night the numbers of patrons had grown, as had the profit, which made the Westleighs less fraught with worry. Rhys could count on one of them–Hugh mostly–to come in the guise of an ordinary patron. Rhys knew they were keeping tabs on what he had created. He’d been watching for one of them when he spied the beautiful masked woman who had just told him she wished to play whist. Rhys had experienced his share of affairs with women. He and Xavier had enjoyed some raucous nights in Paris with willing elegantes, but rarely, if ever, had he been so intrigued as with this woman. Her posture was both proud and wary, and she had come to the gaming house alone, in itself a courageous act for a woman. What’s more, her lips were moist and pink and her voice like music to his ears. “How might a lady find a willing partner?” she asked. What man could refuse her? For the first time since opening the gaming house, Rhys regretted that he could not play cards. He would have relished being her partner and showing her his skill. As it was he must find her another man–To partner her in whist. He quickly scanned the room and spied Sir Reginald, a harmless man who frequented gaming hells and flirted with the ladies, but rarely followed through. His card playing was competent, if not inspired. Sir Reginald would be forgiving if she turned out to be a poor player, but would not disappoint, if she were skilled. Rhys could not imagine her not being skilled at whatever she tried. He wanted her to enjoy herself. He wanted her to like the Masquerade well enough to return. She smiled at Sir Reginald, her pink lips parting to reveal pretty white teeth. Handing Rhys her empty glass as if he were a servant, she accepted Sir Reginald’s arm and walked with him to a card table with two other men. After speaking with the men, the lady and Sir Reginald sat. One of the other men dealt the cards. Rhys had no intention of being so easily dismissed by this mysterious masked woman. He had other duties to occupy him at the moment, but, before she left, he intended to speak with her again. Celia Gale breathed a sigh of relief to finally be seated at a card table, staring at diamonds, hearts, clubs and spades. Entering the game room had been like crossing through the gates of hell. It had taken all her courage to do something so potentially damaging to her reputation. A lady, even a baron’s widow, did not go gambling alone in the dead of night. Even worse, it meant entering a world where other, even greater, risks existed–the lure of cards and dice, the heady thrill of winning, the certainty that losing can be reversed with one more hand, one more roll of the dice. Cards and gambling once took away everything she held dear. The road to ruin was only one one bad hand of cards away. But what choice did she have? How else was she to procure the money she needed? She’d heard of this gaming hell at a recent musicale she’d attended and immediately thought it was a godsend. Two men spoke of it within her earshot. “Thing is, the ladies can attend. It is called the Masquerade Club and anyone may come in disguise,” one had said. “They do not have to reveal themselves?” the other asked. She could gamble for high stakes and no one would know! At last a way to earn the funds she so desperately needed. “Your deal, my dear,” Sir Reginald said, bringing her back to the present. She’d spied Sir Reginald at a few of the entertainments she’d attended, but they had never been introduced. There was little reason to suppose he would recognize her. The other two gentlemen, also unmasked, were unknown to her before this night. She dealt the deck slowly and with deliberation. “Nicely dealt.” The man on her left smiled condescendingly. Her father taught that gambling was part skill at cards and part skill with people. Let these gentlemen condescend. It was to her advantage if they underestimated her. They might become careless in their choice of cards to lay down. When the serving girl came around offering spirits, the gentlemen accepted but Celia nursed one glass of port. She needed all her wits about her. She purposely played as if this were her first time at a green baize table, and, by so doing, the counters grew into a pretty little pile at her right elbow. These gentlemen were betting quite modestly and, she suspected, were sometimes letting her win. She indulged their mistaken impression. Soon enough this room would know her skill and then the competition–and the risk–would intensify. She glanced up. The establishment’s proprietor, Mr. Rhysdale, was watching her. Too often when she looked up he was watching her. It set her nerves on edge. Her blood had raced with fear when he’d approached her after she’d entered the room. She’d thought she’d done something wrong, transgressed some secret code of behaviour that was known only to those who frequented gaming hells. He was a magnificent man, tall and muscled and intense. His eyes assessed everything, but his expression remained inscrutable. What was he thinking as he meandered through the tables, when he turned his gaze towards her? He raised a glass to her and she quickly looked away. What earthly reason made him watch her so closely? There were other masked ladies playing cards in the room. She took the last three tricks of the hand, winning the game. “That is it for me,” one of the gentlemen said. “And for me,” his partner added. She wanted to play more cards. Games of skill, not merely of chance. She was at a loss as to how to manage it. Certainly she would not seek out Mr. Rhysdale to find her a new partner. All three gentlemen bowed and excused themselves, leaving her alone. Celia rose. She busied herself with slipping her counters in her reticule. The night had been profitable. Not overwhelmingly so, but it was a good start. “Do you cash in, then?” He stood so close it seemed he stole the air she needed to breathe. “My pleasure, madam.” His voice turned low. Within a few minutes he rounded up two gentlemen and a lady needing a fourth and Celia played several more games. The gentleman who became her partner was more skilled than Sir Reginald and her counters multiplied. Her carriage came at three-thirty. He escorted her out of the game room to the door of supper room behind. His hand remained firmly on her elbow. Her heart raced. Was he about to tell her why he watched her so intently as she played? If he discovered she was a card sharp, her plans could be ruined. If he presumed she was cheating it would be even worse. Was not her father’s fate proof of that? She wished Mr. Rhysdale would simply leave her alone. When they crossed the threshold of the supper room, Celia gasped. The room was lovely! It was decorated in the earlier style of Robert Adam. The pale green ceiling with its white plasterwork, mirrored the pattern and color of the carpet and walls. The white furniture was adorned with delicate gilt. Servants attending the buffet or carrying trays were dressed in livery that belonged to that earlier time, bright brocades and white wigs. Rather than appear old-fashioned, the room seemed a fantasy of the elegance of bygone days. With all its lightness, Celia felt conspicuous in her dark red gown and black mask. There were four or five tables occupied, some with men entertaining ladies, some with men in deep conversation. Several of them glanced up as she and Rhysdale passed by. “And some wine?” His dark brows rose with his question. At least he displayed some expression. She otherwise could not read his face at all, even though it was the sort of face that set a woman’s heart aflutter. His eyes were dark and unfathomable; his nose, strong. But his lips–oh, his lips! The top lip formed a perfect bow. The bottom was full and resolute, like the firm set of his jaw. In this early pre-dawn hour, the dark shadow of his beard tinged his face, lending him the appearance of a dangerous rogue. It was his position as the proprietor of the Masquerade Club that posed the most peril to her, though. She did not want the attention of the proprietor. She wanted only to play cards and win as much money as she could. He pulled out a chair and she lowered herself into it, smoothing her skirt. Her chair faced the curtained window, but she wanted to face the room, so she could see what he was doing behind her back. When he walked to the buffet, she changed seats. Even as he made his selections at the buffet, he looked completely in charge. There was no hesitation on his part to pick this or that tidbit. His choices were swiftly accomplished. When a servant came near, Rhysdale signaled the man and spoke briefly to him. A moment later, the servant brought two wine glasses and a bottle to the table. He poured wine in both glasses. Celia sipped hers gratefully. The night’s play had given her a thirst and the mellowing effect of the wine was a balm to her nerves. When Rhysdale turned from the buffet, he paused slightly, noticing, she supposed, that she had moved from the seat in which he had placed her. He walked towards the table and her nerves fired anew. Setting a plate in front of her, he lowered himself in to the chair directly across from her. She would be unable to avoid those dark eyes while they conversed. “I hope my selections are to your liking.” His voice rumbled as he lowered himself into the chair. He’d provided some slices of cold ham and an assortment of cheeses, fruits, and confections, all items she enjoyed, but she would have given her approval no matter what he selected. She pushed the food around with her fork. Her brows rose. Was this all he wanted from her? She could not believe it. Now it was she who must avoid the truth. To answer truthfully would reveal that she moved in society’s finest circles and that she could not do. Yes. That ought to suffice. Anyone might attend the theatre. He stared at her for a moment too long for comfort. She relaxed a little. Perhaps he was being honest with her. It made sense that a proprietor would want to know if his place appealed or not. “Secure.” He held her gaze. What she witnessed from behind her mask was not the worst of what she’d heard of gaming hells, where drinking and debauchery might share the night with charges of cheating and, worst of all, challenges to duels. It almost seemed as civilized as a Mayfair drawing room, except for the wild excitement in the eyes of those on a winning streak and the blanch of despair on the faces of losing players. Those highs and lows were part of gambling. Something she must guard against at all costs. As well as guarding against this special notice from the proprietor. His watchful dark eyes made her tremble inside. Too often in her life luck totally abandoned her. “I quite agree.” To her surprise he smiled and his handsome face turned into something wondrous. She found it momentarily hard to breathe. He also rose and walked with her to the ground floor where the cashier sat in a room behind the hall. She felt a thrill watching the coins she’d won stack up in front of her. After scooping them into a leather pouch and placing it in her reticule, she collected her shawl from the dour-faced servant attending the hall. And Rhysdale remained with her. She suddenly was very eager to return. So eager a part of her wanted to reenter the game room and deal another hand of whist. “You are very welcome.” His voice turned low and seemed to resonate inside her. She crossed the threshold, relieved to take her leave of him, but he walked out into the dark night with her. The rush lamp at the door must have revealed her surprise. “I will see you into your carriage,” he explained. Her coachman drove up immediately and she was grateful her carriage no longer had a crest on its side. Rhysdale opened the coach door and pulled down the steps. He held out his hand to assist her. His touch was firm and set her nerves trembling anew. His pleasure? She took a breath. The coach pulled away, and she swiveled around to look out the back window. He stood in the road, illuminated by the rush light. Finalist for Best Historical in NJRW’s 2013 Golden Leaf Contest. One of the Top 100 best sellers on Mills and Boon! 4 Stars! 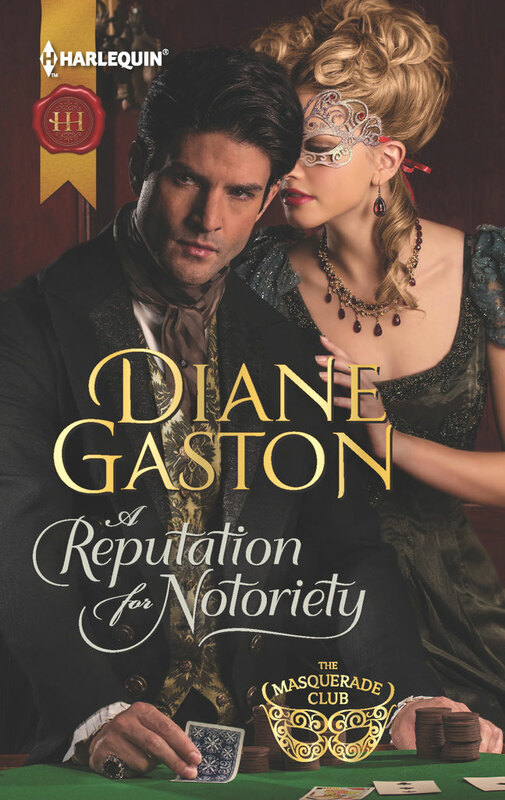 Diane Gaston, always a Regency romance fan favorite, pens another winner with her latest historical romance that is first in her new Masquerade Club series. A Reputation For Notoriety has all the elements of a well-written and entertaining Regency historical romance: an intriguing premise, a different yet wonderful hero and heroine, the setting–the fascinating world of gambling, a well-developing romantic relationship, as well as touches of suspense and sensuality. This reviewer is looking forward to the next book in the series! A Reputation for Notoriety is the first book of three set in a gaming house called the Masquerade Club, which is also the name of the series. During the Regency card playing was a very popular pastime, not only for serious gamesters, but also for home entertainment and society parties. Every gentleman’s club had a card room; every ball and party, as well. At such high class places, players could depend upon an honest game, but there were also less reputable places to play. Gaming “hells” were places where the innocent might be easily fleeced and the “Captain Sharps” win huge fortunes. Of course, Rhys, the hero of A Reputation for Notoriety, does not. The Masquerade Club is a reputable establishment. Whist, the precursor of today’s Contract Bridge, was one of the period’s most popular card games. The game requires four players, playing in partners. A trump suit is chosen and tricks are won. In Whist, strategy improves the player’s ability to win, so a poor player is a great frustration to a more skilled partner. Whist was the game of choice for Celia Gale, the heroine of A Reputation for Notoriety. Piquet is another popular Regency card game (My hero and heroine played a game of strip piquet in The Wagering Widow). It is played by two players and has a complicated scoring system and possibilities of huge bonus points. Skill, strategy, and memory for cards are all very important for success in Piquet. Vingt-et-un from the Regency period is essentially today’s game of Twenty-One. Each player tries to beat the dealer by earning twenty-one points or reaching a higher number of points without exceeding twenty-one. Celia also plays this game. Faro is not really a card game but a game of chance using cards. It is played at a green baize table displaying pictures of playing cards. The player bets on whether a certain card will be dealt from a special wooden box. In the late 1700s fashionable ladies set up Faro banks in their homes, but this practice fell out of favor by the Regency. Hazard, another game often mentioned, is not a card game at all but a dice game. The player must roll a certain number on the dice. There is some strategy involved in which numbers the player selects to roll, but Hazard is essentially a game of chance. Hazard proves especially important in A Reputation for Notoriety. This is the game which almost tempts Celia into a gambling fever like her father’s. Great fortunes were lost at the gaming tables during this time period. Beau Brummell is perhaps the most famous example of a man who plummeted from the heights of society to the depths of poverty. This arbiter of fashion died in squalor, exiled to France because of his gambling debts. The fact that he offended the Prince Regent by calling him fat did not help Brummell’s cause. One of Lord Byron’s close friends also fell victim to a gambling addiction. Scrope Berdmore Davies was a dandy who lived a fast life and would have been almost entirely forgotten had not a trunk been discovered in 1976 at Barclays Bank, having been deposited by Scrope Davies for safe-keeping when he was forced to flee the country in 1816 because of gambling debts. Included in the contents of the trunk were Davies’ bills, including a summons listing a 7000 pound debt. A gentleman’s gambling debts were “debts of honor” to be paid before debts to shopkeepers or tailors and such. Cheating at cards was a seriously dishonorable act. Gentlemen accused of cheating often challenged their accusers to duels to preserve their good names. In his early career, the Duke of Wellington fell victim to the gambling fever and almost sold his commission to pay his gambling debts. He was rescued by Lord Camden who paid Wellington’s debts and arranged for the young Captain to further his military studies at Angers, where he could learn how the French waged war. Imagine how history might have changed in India, in Spain, at Waterloo, had not those debts been paid. A version of this article first appeared on the Harlequin Historical Blog on February 14, 2011.